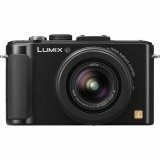 Amazon has the Panasonic lumix dmc-LX7K 10.1 MP digital camera with 3.8x Optical zoom and 3.0-inch lcd - black for $497 with free shipping. Sells for $497+ Highest Price. Deals for $299 Lowest Price. Normally $380+.